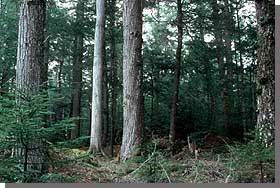 Sporting Lake Nature Reserve protects an old-growth climax coniferous forest of eastern hemlock, white pine and red spruce. Only scattered remnants of these Acadian Forest elements exist in Nova Scotia, largely due to the commercial value of softwood species and a history of poor forest management. However, on the three small islands within Sporting Lake that comprise this small protected area of 25 hectares, there is no evidence of significant human disturbance. As one of the last intact old-growth forests of the Maritimes, the site has excellent potential for genetic conservation and research, particularly long- term monitoring and detection of climatic and environmental change.